Is your mother, grandmother, sister or close friend a gardener? 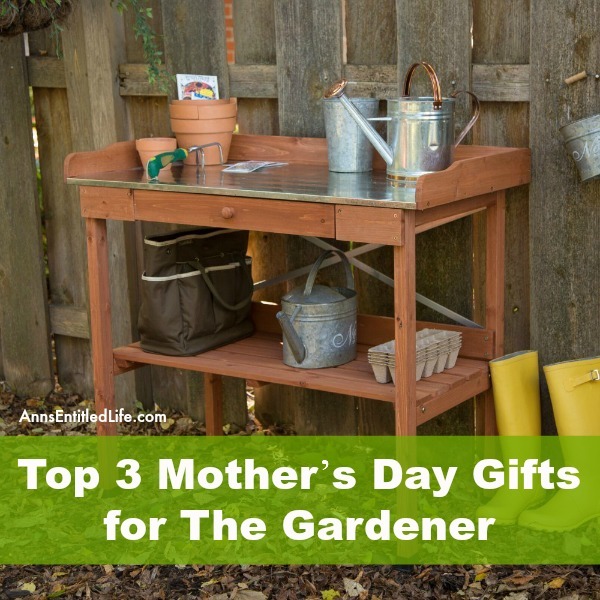 If someone close to you loves to garden, get her a Mother’s Day gift that honors her favorite hobby. The gift of gardening. • Every woman loves cute and functional things to wear. For the gardener in your life, a pair of waterproof rubber boots is a great gift. These boots will be easy to put on, and if you find one with a shorter height it will make it easier for mom to slip them off and make trips back into the house. These are usually available in a variety of fun colors like red, green, and purple. • While we are protecting mom’s feet, we should consider protecting her hands too! A great choice are gardening gloves. Gloves with long cuffs are great for protection against thorns and other prickly bits. Find them in a cute, bright color or a fun pattern. • And let’s not forget Mom’s complexion. A wonderful gardening hat will keep the sun off her face, helping to prevent. sunburn, wrinkles, and skin cancers. Choose one with a brim that is wide enough to shield the face, but not so floppy it gets in the way of the eyes when bending over. • Plant Stands: For the gardener who likes orchids or other houseplants there are a variety of beautiful plant stands you can give your mother. Consider a plant stand with unique glasswork or metal detailing. • Pop-up Raised Bed: For a vegetable gardener, a raised bed will be an instant hit. • Wrotter: This Dutch tool called a wrotter has a sharp point and barbs to help pull out any weed. • Sharpener: Every gardener needs sharp pruners in order to make sure the garden is at its best. A small sharpener that she can tuck into a pocket without effort is a great idea. • Water Bottle Spout: If your mom is into recycling, this will be a great gift. It screws onto a used soda or water bottle allowing you to water plants. • Garden Seat: As we age, getting up and down off the ground can become more of a chore. With a garden seat weeding is made much easier. Choose a wheeled unit with storage or stationary garden seat/kneeler according to need. • Pottery Bench: organization, storage and a flat surface to cut flowers, transplant and temporarily hold harvested fruits and vegetables before bringing them indoors. What more could a gardener ask for? • Although material gifts are a nice token of love, nothing beats spending time with our loved ones. Give mom the gift of an afternoon of gardening with you. Even if you aren’t the world’s best gardener, she will think you’re the world’s best son or daughter. If you have a gardening Mama, there is no way you can go wrong giving your mother something to wear, something to use, or someone to garden with. Any of these gifts will put a smile on your gardening mother’s face. Great Mother’s Day ideas – I think this year I’m going to build my mom a birdhouse so she can put it in her garden. Me I’m downsizing so perhaps just a nice quiet afternoon will do nice.